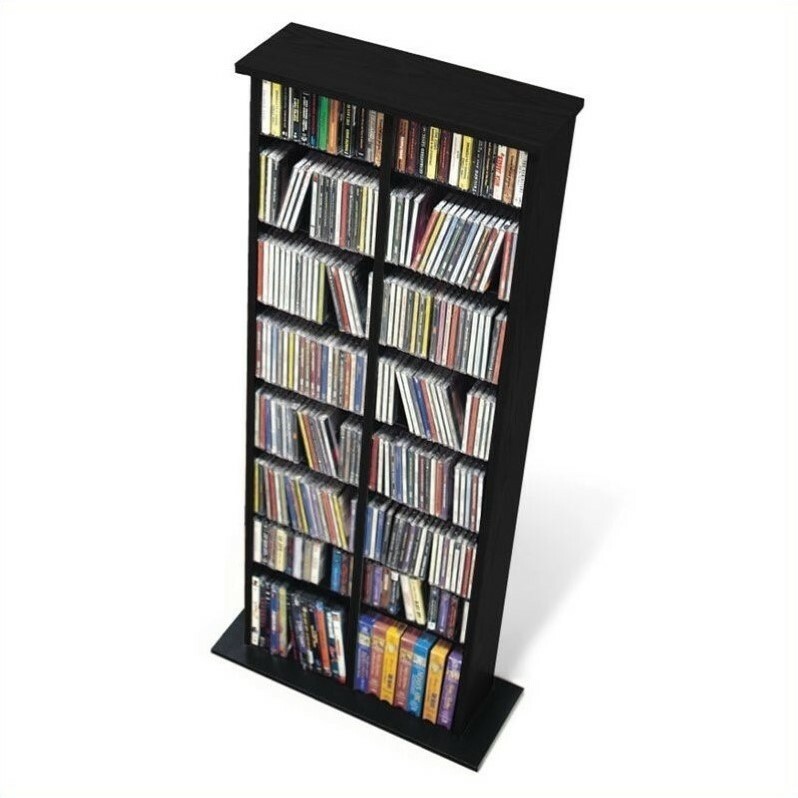 Prepac 64" 4-Sided CD DVD Spinning Media Storage Tower in Black - in stock! Prepac 64" Triple Barrister CD DVD Media Storage Rack in Black - in stock! This attractive multimedia storage tower, with central divider, is designed to accommodate any combination of media in a modest collection. Fully adjustable shelves can be set to any position to accommodate your collection and to ensure flexibility for future expansion. Bedroom, living room, and home furniture from Prepac combines modern styling and the affordability of ready to assemble furniture. Since 1979, Prepac has been honing the style and craftsmanship of their products at their Delta, BC facility, just outside Vancouver Canada. Over the years, they’ve become a leading manufacturer of cost-effective, environmentally friendly furniture. Browse their furniture collections for office and media pieces including desks, hutches, Prepac TV stands and media storage. In addition to their clean, minimalist styles, Prepac furniture is made with engineered woods, as durable as they are economical. Choose from finishes including black, cherry, espresso, maple, and white. Modern and transitional bedrooms are easy to coordinate, easy to assemble, and very affordable when you choose Prepac bedroom sets. Build a unique room by starting with a Prepac headboard or bed frame, adding Prepac dressers, nightstands, mirrors, and more. These bedroom furniture collections, in light and dark finishes, are ideal for first apartments, guest rooms, or any contemporary space for which you want value-oriented, coordinated pieces. Create a unique, cleverly designed modern media room with Prepac’s television and entertainment furniture. Prepac TV stands come in wall-mounted, corner, and armoire models, along with designs sturdy and broad enough for large LCD televisions. Once you’ve housed your televisions and media players, add media storage units from Prepac to keep your DVD's tidy and organized. Choose conveniently scalable units, adding extra storage as your movie and music libraries grow. Prepack’s office furniture features the same contemporary styling, durability, and affordability as their bedroom and entertainment pieces. For your home office, student apartment, or commercial workplace, Prepac desks, bookcases, and hutches make it easy to coordinate a practical, yet attractive work area.